American artists of the 20th century. 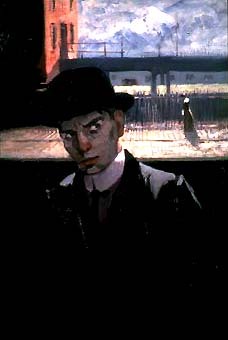 In a career spanning more than fifty years, with its origins in the Ashcan school of Robert Henri and the l913 Armory Show, he created an idiosyncratic style of Cubism that successfully translated the jazz- inflected dynamics of the urban American milieu into an international language of modernism. He was also a brilliant thinker and leader whose contributions were instrumental in elevating American art from ils provincial status. "With formidable skill, tenacity and courage, Davis proved that it was possible for an Americn to accept the challenge of the Europeans without relinquishing his native identity orpriorities" (Diane Kelder). Oil on Canvas, 81,3 x 66 cm. Courtesy of Salander-O'Reilly Galleries, New York. 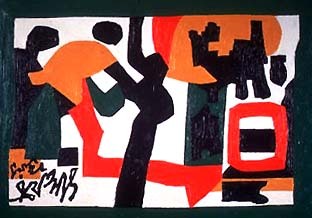 Paintings have been loaned from the artist's Estate, from the Israel Museum, Jerusalem, from the Thyssen-Bornemisza Museum, Madrid, from numerous United States museums including the Addison Gallery of American Art, the Boston Museum of Fine Arts, the Brooklyn Museum, the Chrysler Museum of Art, the Cleveland Musellm of Art, the Hirshhorn Museum and Sculpture Garden, the Johnson Museum of Cornell University, the MemorialArtGallery, Rochester, the Menil Collection, the Metropolitan Museum of Art, the Museum of Modern Art, New York, the National Museum of American Art, Washington DC, the Philadelphia Museum of Art, the Rose Art Museum of Brandeis University, the Solomon R. Guggenheim Museum, the Sunrise Museums, Charleston VA, the Whitney Museum of American Art, and from several private collections. Oil on Canvas, 61 x 83,8 cm. The exhibition catalog, in English and Italian langllage editions, is published by Electa (Milan), and includes essays by authoritative scholars of Davis's life and art (Diane Kelder, Lewis Kachur, Wayne Roosa and Karen Wilkin), "the jazz of Stuart Davis"by music critic Ben Sidran, 'Davis and Europe' by Rudy Fuchs, 'Davis and the Biennale' by Federica Pirani, an interview with Piero Dorazio and a selection of writings by Davis himself.